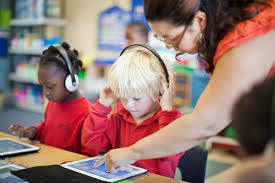 There is no doubt that iPads do provide the teacher with new and innovative ways of teaching a tired curriculum. But they should be 1 of a variety of different tools in a teacher’s arsenal. The fact that schools are making everything about the iPad is a very sad indictment on other tried and true ways to engage the learner. 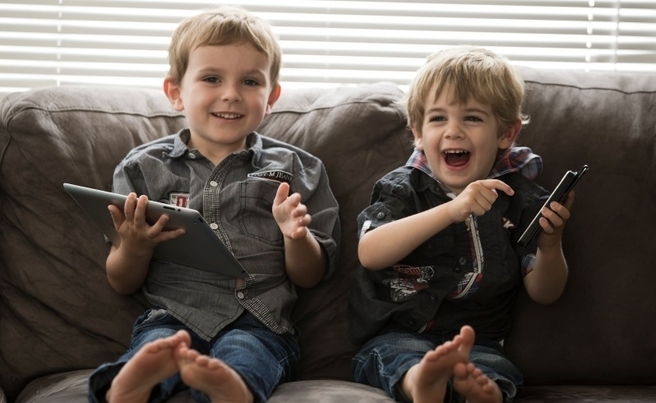 Swiping a finger on an iPad is as natural to a modern preschooler as turning a page – but little research has been done on the impact of technology on children’s health. Curtin University’s School of Physiotherapy and Exercise Science wants families for a study into the effects using devices can have on children’s development and posture. Researcher Erin Howie said many schools used iPads and parents asked Curtin for advice after some children complained of sore necks from bending over them. The study iMove, iPlay will focus on children from birth to five to find out how often they use technology and what for. Researchers will observe children aged three to five in a laboratory to measure their physical activity while they play. In earlier research, the Curtin team found schoolchildren tended to hunch over more when using a tablet but also used a bigger variety of positions. Dr Howie said it was better to use a neutral posture with neck and wrists straight. Paul Taylor said sons Michael, 4, and Daniel, 2, were allowed to play educational games on an iPad or smartphone once or twice a week. “We’re more into getting them outside and playing and reading books,” he said. Tags:Center for Cognitive Technology, Education, Erin Howie, iMove, iPlay, News, School of Physiotherapy and Exercise Science, Technology in the Classroom, the impact of technology on children's health. Let’s talk Facebook, shall we? Chances are pretty good that your students can be counted among the 1.3 billion monthly active users of the social media giant, and there’s practically no other website that contains such a breadth and depth of personal information. Encouraging students to put all of their social media accounts, including Facebook, on a short leash might be the most important step toward helping them manage their digital footprint. Look into Facebook’s proprietary privacy tips or get the works from Lifehacker.com with it’s “Always Up-to-Date Guide to Managing Your Facebook Privacy,” then inform students about the steps they can take. Better yet, just pass the links along. Complete privacy on Twitter is simple — you just choose to protect your tweets under “security and privacy” on the account settings page — but encouraging students to do so might do more harm than good. Some teachers have gotten great results using Twitter in education, and a class full of students with protected tweets might interfere with that. Then delete the ones you no longer use. That myspace page you signed up for? Don’t just forget about it–find it and delete it. Perhaps the best tip for helping students maintain privacy on Twitter is one that can be applied across the whole spectrum of social networking tools: Don’t overshare. As much of an alien concept as it may be to students these days, the only sure-fire way to avoid digital footprint trouble is for them to keep quiet about anything they wouldn’t want to share with everyone in town. This includes usernames, aliases, passwords, last names, full-names-as-usernames, pictures, addresses, and other important information. When you link your facebook or twitter account to that new site (whatever site that might be), you may not realize–or care at the moment–what you’re giving it access to. It’s usually safest to use a secondary email address to sign-up for new sites rather than granting this kind of access. Whether you’re communicating with someone new, or signing up for a new social media platform, it can be useful to have a secondary email address. That said, you don’t need 12. Keep it manageable. Every time you send a message, post, or picture, you’re publishing it the same way CNN does a news story. And the internet never forgets. There’s another side to your digital footprint, too — it’s not always information that you choose to make public. Remember: Privacy controls or no privacy controls, Facebook still records and uses every scrap of information it gets to better determine its users’ marketing demographics. Google pulls the same trick with search and browsing habits. If a student is logged into their Google account, the service tracks every keyword they search, every Web page they visit and every time they visit Youtube. There are ways, however, to control the bits of deep data that we leave strewn around. First of all, even though Google is practically an official synonym for “Web search,” it isn’t actually the only game in town. Less profit-motivated search engines like DuckDuckGo.com and Ixquick.com may take a little getting used to, but they do make explicit policy of protecting users’ browsing privacy. A host of browser extensions and app add-ons can also limit the surreptitious capture of personal information. Disconnect (Disconnect.me), DoNotTrackMe (Abine.com) and Ghostery (Ghostery.com) are examples of cross-platform extensions that block tracking cookies and give users control over site scripts. 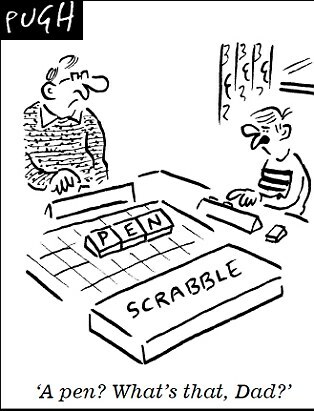 Click on the link to read Are Educators Being Conned by the i-Pad? 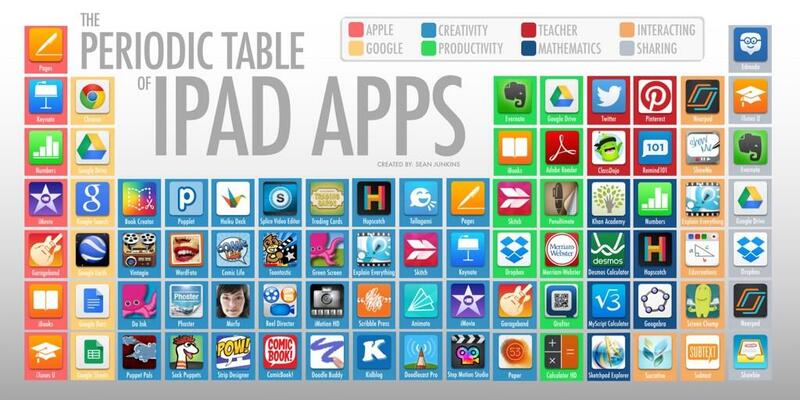 Known as the periodic table of iPad apps, these are all extremely useful for the classroom. Click on the link to read Should Teachers be able to Text Students? Google Drive is a free online storage cloud that has Google’s version of Word, Powerpoint and Excel built into it. It allows students to create documents for free on the go. They can access and edit these documents on a tablet device or computer from various locations with their Google account login. They can share the documents they are working on with other students and can even work in one document at the same time to co-create pieces of work. They can also share the document with their teachers while they work or once they’ve finished to get instant feedback. Teachers can help students with the creative writing process by getting them to share their stories as they write so you can feedback live without stopping their creative flow. You can give them quick and easy targets through the chat facility or highlight specific sections and create a comment – they have to respond to these otherwise the comment alert won’t disappear. You could also get students to co-create a presentation with one another on an element of the social or historical context of a text you’re studying, for example. Once finished, they can share the document with you, close down their computers and come up one at a time and simply click on their presentation now housed in your drive for instant feedback. Edmodo is a free social learning platform for students, teachers and parents. It looks a little bit like Facebook so it is a familiar format for students to use. But before you run for the hills, it is very different to Facebook in that it’s completely controlled by the teacher and specifically designed for educational purposes – one of my classes has affectionately named it “Fakebook”. It has a shared timeline as a homepage where you and your students can interact and you can allow students to interact with one another, if you wish. Both teachers and students have a library where they can store documents and share them with others if they want to. The teacher can set assignments, students hand in assignments and teachers feedback on the work all within Edmodo. Two particularly useful functions are the quizzes and polls, and there’s also a built-in grade book that houses your teacher-assessed grades and quiz results for each student. It really is a very useful all-round tool. You could consider saving essential documents – such as mark schemes, poems being studied and teaching presentations – in the class library to give students easy access to these at any time. You could also post photos of classwork completed by groups of students or individuals so all the students can see it for best practice. You could schedule weekly spelling tests – set as multiple choice quizzes – through Edmondo which will automatically collate the results so you can easily see trends within the class’s performance. There a loads of tools out there that capture your computer or device screen and allow you to record your voice while you do so. Two that are often used are ScreenR which is free and Explain Everything, which is quite cheap. The idea is that you can take a picture of your computer or device screen and then set your voice against the website or pre-prepared powerpoint. If you collate these in one place, you have a bank of instructional videos. A simple way to use this tool is to create short instructional videos to help your students study independently or revise a topic. For instance, you might create clips outlining different writing styles or perhaps your team can work together to create clips on themes you all think are important. You could get students involved and ask them to prepare a short videos explaining poems that you have been studying as a revision tool. One way to collate the videos created by a screencast tool is to start a YouTube channel and upload them all there. This is simply your own YouTube home page – you can style the background, upload profile information and follow other channels of interest. You can also create playlists within your channel to organise videos into topics and allow students to find them easily. If creating your own videos is not for you then you can create playlists of videos that are already out there that relate to the topics you are studying. What about creating a channel for your department? Create a playlist for each topic on your curriculum map from myths and legends to war poetry and creative writing. All you would need to do is to drop in videos of your choice. The videos could be created by your students, staff or just found from educational sources around the web. The clips could help students get more from the topic or encourage them to read and research around the subject – a wonderful resource for years to come that you can regularly update. There are many blogging platforms around but the two that are most popular are WordPress and Blogger. If you’re looking for the easier of the two then Blogger from Google is the one. 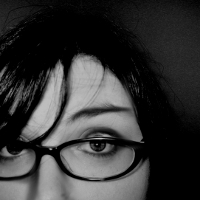 If you want a more sophisticated platform then WordPress is probably a better choice. A basic blog allows you to have a rolling front page of updating posts and static pages accessed via tabs, often along the top of the page. It is a great record of the year for the students to look back over. Get your students to create their own blogs and use them as digital portfolios for the year, posting up their best work. Getting feedback from a real audience as well as peers, parents and teachers is a great opportunity for development. How about creating a blog for your class? You could update the main page with homework tasks, recommended reading and updates from your classroom. Try creating a post with a task or question based on the topic you’re studying and get the students to use the comments facility to respond. They could even extend their answers by responding to one another’s comments. You could use the blog as a record of lessons by uploading presentations and photos. If a student is ever absent, this is an invaluable tool to enable them to keep up. If there is a subject that benefits the most from visual medium, then it has to be History. It’s not a secret that many students find this particular field of study uninteresting, dull, and irrelevant. Of course, to us educators, that is not the case. But because history is comprised of entangled events that stretch endlessly from the time of the Neanderthals, it is hard for teachers to avoid the pitfall of history teaching for young learners –boredom. This app is a cornucopia of historical footage, comprised of over 5,000 (and counting) videos on demand for free. It offers a wealth of archival footage, newsreels, olden broadcasts, images of important events and many other visual aids. Rather than letting students read up on a boring wall of text, American History on Video will show them exactly how it happened and how people at that time reacted. Hook up your laptop on your iPad and play the most exciting videos for the class. Expect many raised hands when the question and discussion time comes. Sheldon Jones, Verizon’s Public Relations Officer, said in his article that other historical apps such as the Civil War Trust Battle App and the Historic Gettysburg Walking Tour app are perfect for discussing the American Civil War. Role-playing games are great tools for teaching history, especially on topics that tickle the imagination of young kids such as the Greek and Roman era. Secret Builders enable children to do just that – create a virtual world where they can participate in the economy, talk to prominent people, create art and many other things. Recommended for students on the first to fourth grade, they will get a clearer picture of how it was to live during the romantic era. This website is the epitome of engaging students through visual means. With Time Tube, students can type in a moment in history; and a series of related videos will be laid out on a timeline. Very easy to use and informative, this tool is even recommended for teachers to expand their knowledge on a particular historical event. Teachers can also create a custom timeline which students can access, acting as a learning aid and lecture guide. Created by Microsoft Research, the app contains massive amounts of curated content about thousands of topics including most of those in the curriculum of a history teacher with the help of international researchers. Middle-school teacher Samantha Shires vouches on the effectiveness of the tool. “Chrono Zoom breathes life into history,” she said. The main brain behind Chrono Zoom is Professor Walter Alvarez from the University of California Berkeley. He was one of the proponents of the theory that an asteroid was the cause of the extinction of dinosaurs. History is far from boring and dull. It’s our job as educators to present this fascinating subject to learners in an interesting and engaging manner. With tools such as the ones mentioned above, it is easy to create an enjoyable history class. What other tech tools for history did we miss? Tell us your favorites in the comment section below. Jennifer Birch was a volunteer teacher and Ed-tech researcher. She spends most of her time writing and reading. Read more of her musings on Techie Doodlers. Contact her on Twitter or Google+. Why is it Always the Kids’ Fault? 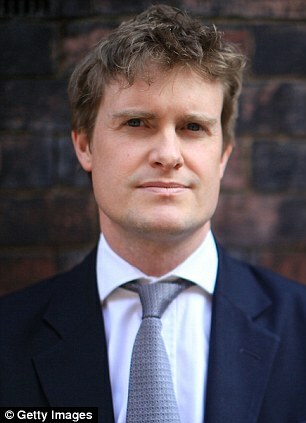 The UK’s Educational Secretary, Tristram Hunt, has called for schoolchildren to be given ‘concentration lessons’, to fight the effects of social media and digital gadgets. You know what this makes me want to do? Confiscate Mr. Hunt’s phone for the day. See how he copes without his “digital gadget”. 1. They call on teachers to instruct children to become more resilient when studies show that children are far more resilient than adults. 2. They legislate against lunches that c0ntain cheese and yogurt and crisps when the average staff room often contains cakes and biscuits and lollies. 3. They become obsessed with ICT to the point where schools are expected to heavily integrate iPads and interactive Smartboards apps, but then complain that such technologies are causing our children to lose concentration. Why do we always focus on a child’s lack of concentration and never on a teachers ability to engage? Why is it always that children have lost the capacity to maintain concentration and never that the teacher has offered up a turgid series of worksheets and unimaginative activities? If you think the children of today are that much worse than you or I when it comes to concentration, attend a professional development seminar and observe all the bored teachers scribbling on their handouts and staring out the window. And yes, watch as many of them will reach for their digital gadgets at some point during the lecture to catch up with any Facebook updates they may have missed. 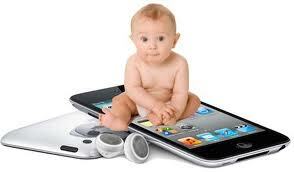 Toddlers these days are barely out of nappies before they are playing with touch-screen toys and fiddling with iPads. And now, it seems, they are paying the price – because when they arrive at nursery they are apparently struggling to pick up basic fine-motor skills such as holding pencils, pens and crayons. Some nurseries have installed interactive ‘smartboards’, digital cameras and touch-screen computers to try to expose children to gadgets at an early age. One of the learning goals in the revised Early Years Foundation Stage (EYFS) is that ‘children recognise that a range of technology is used in places such as homes and school’. Under a section on Understanding the World, youngsters must also find out about and ‘identify the uses of everyday technology and use information and communication technology (ICT) and programmable toys to support their learning’. Some nurseries have prioritised ICT as a result and ploughed resources into improving their facilities. But literacy expert Sue Palmer said: ‘I think what children really need up to the age of seven is real life in real space and real time, which means three-dimensional experiences. ‘We already have problems with children not being able to hold a pen or pencil. A survey of 806 parents and early years staff carried out by website daynurseries.co.uk found that only 26 per cent believed that being exposed to technology actually benefits children in nurseries. 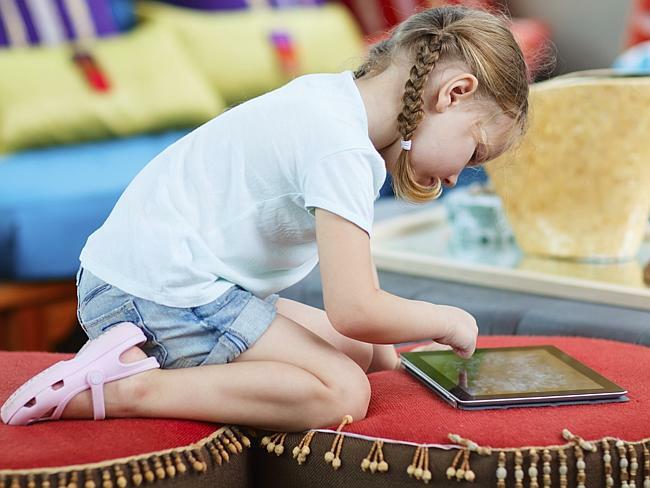 Davina Ludlow, director of daynurseries.co.uk, added: ‘Children are increasingly exposed to an overwhelming amount of technology at an early age. ‘The use of iPads in nurseries, which are displacing the traditional methods of learning and playing activities is concerning. Ms Palmer who is also the author of Toxic Childhood added:‘I think what children really need up to the age of seven is real life in real space and real time, which means three dimensional experiences.